If your senior loved one is looking for care services, you may have to take on that financial burden yourself. Even if your loved one has insurance and some money saved up, the cost of elder care in Canada can be quite high. Before you take out another mortgage on your house or dip into your children’s college fund, there are ways to help with senior care without going broke. Our tips will ensure your loved one gets the care they need at a price that works. Speak to your loved one and make a detailed plan of what they can afford and what you can afford before settling on care. Different people require different care and you may not need to hire a full-time caregiver for your loved one, or you may need to look into elder care facilities. Just because your loved one is getting older and isn’t as mobile as they once were doesn’t mean that they need to move into a seniors residence. The federal government has programs available for seniors who require care. These programs range from Employment Insurance benefits for those who need to take time off work to care for an elder loved one, to available financial assistance for seniors who need to move to a caregiving facility. Meet with your bank or an independant financial advisor and inquire about programs and loans available for senior care. You may be able to draw from existing funds like an RRSP or TFSA. Furthermore, your bank or advisor can steer you towards a loan that makes sense for your situation with more flexible options. You can also set up an emergency funds account to be used specifically for elder care to deal with unexpected costs that can crop up such as moving your loved one to a facility or hiring an overnight nurse. If your loved one is looking to move into an elder care facility, they will probably need to sell their current home. Talk to them about using the proceeds from the sale of their home to pay for their care. The cost of assisted living facilities varies from one place to the next. Before visiting with your loved one, check out the facilities on your own to ask questions about price flexibility. Then narrow it down to only the places you feel are affordable, clean and safe for your loved one. Now, when you bring your loved one to tour the facilities you’ll have a price point in mind. We’re here to help! 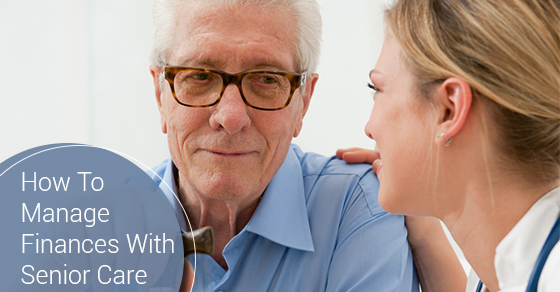 For more information about senior care for your elderly loved ones, contact us today.